I always love the first weeks of January, don’t you? December can be crazy. After all, if you’re not really intentional about it, getting through all the activities in December is like trying to squish your after-holiday body into a pair of too-tight jeans. January means a new year and a fresh start to our homeschooling. Remember ripping into the brand new notebooks, art supplies and books last fall? You were full of plans and excitement about the homeschool year ahead. You know how to regain that organized confidence you started the year with? Do a simple mid-year homeschool assessment. take stock of exactly where you are in your homeschool year. figure out what kept you from being where you wanted to be by now (if you’re not where you would like to be). make a plan to work through the problem areas so you can have a more smoothly running homeschool and household. be more organized and therefore feel more confident. You’ll feel so much more energized and organized instead of flying by the seat of your pants and hoping you’ll get done with school on time. Also, you’ll have identified and corrected some of the issues that have held you back first semester. So, instead of constantly putting out fires, you’ll be able to be so much more intentional in the way you spend your time. Let’s start our homeschool assessment with the academics. How’d everyone do last semester? How are your kids progressing in each subject? The easiest way to evaluate this is by using a spreadsheet if you’re a techie, or make a table or just write it down if you’re a pen-and-pencil girl. First, across the top, figure out and write down how many days of your school year you’ve completed so far. Then divide that by the total number of school days you’ve planned for the year. Then you’ll know what percentage of your homeschool year you’ve completed. In this example, this family has completed about 50% of their school year. By looking at how much of their curriculum your kids havce completed, you can see if they’re on track with the homeschooling time you’ve spent so far. 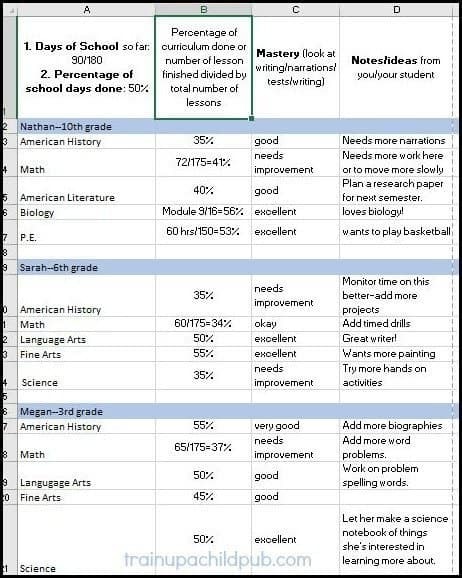 Ideally, you’ve done about the same percentage of school work as the percentage of the year you’ve finished. But, unfortunately, that’s not always the case. You get busy. In the subjects kids like, they are often right on schedule. In the areas they (or you) aren’t as crazy about, they can lag behind. And there are other reasons to be behind… we’ll look at those in a minute. Now you know in what subject areas you need to spend time catching up. But that’s only part of the picture. It’s helpful to know how much of your planned content or curriculum your kids have completed. But there’s another part of the academic picture you need to consider. Do your children actually understand and remember what they are learning? Are they getting their lessons done, but not retaining much? Or do you see evidence that they are understanding and remembering what they’re learning? They’re demonstrating in their conversations and narrations they understand the vocabulary of their science topics. Their written narrations and reports show improved grammar, spelling or sentence construction. Your highschooler is using simple algebra to decide how much of an ingredient to use when tripling a recipe. When playing a game or having a discussion, your students exhibit their knowledge of a historical figure or time period. At the library, your students ask for extra books about a subject you’re studying that intrigues them. If they’re showing mastery, that’s fantastic! Great job, Mom! Do you need to add more activities or experiments to your science reading to help your students grasp a concept? How about making history more real by incorporating more excellent children’s historical fiction into their studies? Or maybe it would be more interesting to your children to add more high interest activities into their schooling. Like cooking meals from the time period or culture they’re reading about. Or dramatizing a scene from a story. Or working as a group to throw an authentic Renaissance feast. You can also ask your kids for opinions. What do they like or not like about what they are learning? What ideas do they have for making particular school subjects more enjoyable? Step 3: If you’re behind… analyze WHY. If you’re behind schedule, think about WHY that’s so. Have you had excessive illness in your family? Or have things outside your control happened that have kept you from being able to keep up with school? Are you behind because you have one or more children that aren’t willing or motivated to get their work done? Maybe you’re out of balance with the amount of time you’re spending on field trips, sports activities, church activities, or music/art lessons. Could the reason you’re behind is that you’re too busy juggling other tasks to focus on keeping school going? Or maybe the household or school materials are too unorganized. You know – you’re ready to do math but he can’t find his math book. Take an honest look at your first semester and write a list of things that are keep you from getting school done as you’d like. Be specific. Now examine your list of things that have kept you from getting more done this last semester in your homeschool. If your family had a crisis of illness, extended family issues, or other circumstances outside of your control… I’m so sorry you had a rough semester. Don’t beat yourself up about it. It was outside your control, so just be as consistent as you can from here on out. Again, just don’t beat yourself up about it! Do you have things on your list that are under your control? Make plans to start working on them, one at a time. Hear me: One at a time. Work on one thing at least a month before adding anything else. Otherwise, you’ll be overwhelmed. If you have character issues in one or more of your children that keep from getting work done, make a specific plan to deal with the issue. Don’t get so busy that you neglect it. It won’t get better on its own. And believe me –what is difficult at age nine is going to be a lot worse at age 13! Look at your time management. How much time are you spending in the car versus home getting school done? If you need to cut down on activities to get your school done, do it! Do errands on the weekends or group them and listen to audiobooks in the car. If you need to get out of the house, try doing school at a park, the library or even in the backyard. Do you work at home (or outside the home)? It’s a juggle, isn’t it? Can you manage your time so that you can get both homeschooling and work done? Perhaps trade childcare with another working mom. That way you can each work for a concentrated amount of time without interruptions. Or get your husband or a friend to help with watching kids and work on the weekends. Or perhaps it would help to go to bed earlier than you’re used to so you can get up and get some work done before your children get up. Do you stand in front of an open fridge every night about 5:30, wondering what you’re going to be serving for dinner? Take a little time on the weekend to make a meal plan for the following week. It will save you a ton of stress. And time. And money if you are quick to jump in the car and go out to eat. If you are disorganized, build a habit for you and your kids of having a specific place for school materials and putting them away at the end of every school day. If you aren’t used to this, you can learn to do it. It’s just a skill that you develop by doing it every day. This one thing can make an incredible difference in how smoothly your days go! You may have to take a day or two off school and work together to get the house in order. But you can do that. After all, you are in charge of your schedule! Getting organized is worth your time for things to go more smoothly. Please understand that I’m not trying to minimize your issues. I’m not saying that there aren’t obstacles that can be really tough, like homeschooling as a single parent, living in a very small space, or with a non-existent budget, teaching kids with learning issues, or dealing with chronic illness. If you need help with this, could you write and tell me what your issues are that seem insurmountable? I would love to hear them and pray for you. Just hit reply and pour your heart out. I read and respond to every email. (Although it might take me a few days). Maybe you’re already back into the swing of things and don’t want to stop and do a homeschooling assessment right now. That’s okay. But please consider doing one sometime this month. You won’t regret it. It will be worth your time, I promise! So have you ever done a mid-year assessment before? What’s kept you from doing it in the past? P.S. Want this post in pdf format? This is a really good idea. Too often we reach the end of the school year and then find out we were way off schedule or our child just wasn’t absorbing the material. Or we stuck with a curriculum a lot longer than we should have. Stopping and doing a checkup would prevent all of that. Thanks for the great tips!